Blackpool is a rather surprising place; traditionally it’s a seaside town sea, sand and ice cream. But it’s also a lot more as I found out during a couple of trips there, when the sun shines it can be quite beautiful however it never shines for long and today was no exception. What makes this shot is the broken almost deserted facade of the pier itself we can see pieces of the pier missing and the general abandonment of the attraction is mirrored in the foreboding skies. When I shot this I was initially thinking of producing a High Dynamic Range shot, enhancing the colours and broadening the depth between the light and shadow. However once I started to process the image something was not quite right, I know on occasion we make a mistake when shooting but more rarely we have a concept in our imagination which is wrong, and this was one such case the rich colours and wide tonal range of a typical HDR shot seemed at odds with the gritty atmosphere of the coast. 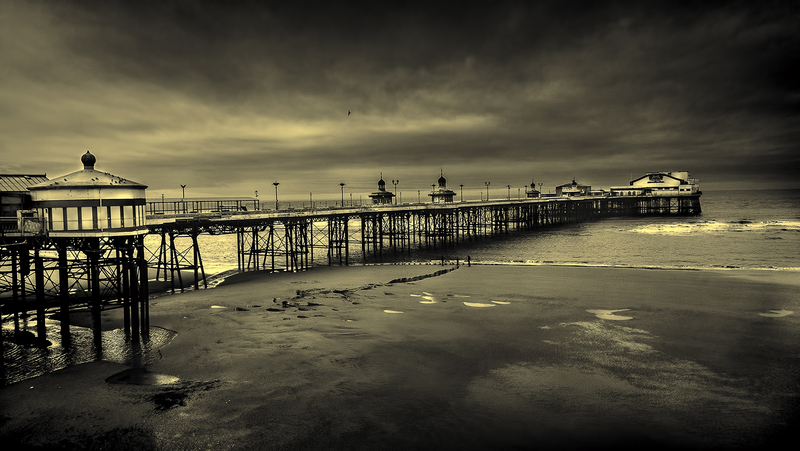 I started again and once I started to develop the image from its RAW file with a black and white image in mind everything fell into place the dark foreboding skies contrasting with the whites of the fading wooden pier boards leading the eye to the iron grey of the sea. A lone bird circles the pier as if to find that last scrap of food and I deliberately waited until it flew into the centre of the frame before taking the picture.